Both Dipl. mechanical engineers, Gerhard Kieser and Uwe Kirchenbauer, founded the engineering office Kieser-Kirchenbauer GdbR. The main focus was set on constructing and planning for the research center of Karlsruhe. Foundation of the manufacturing plant Kieser-Kirchenbauer GdbR. As an industrial part of the company the projects of the engineering office were realized. A large and very experienced manufacturer of gloveboxes gave up. The German government canceled investments for nuclear technology, which forced this company to take this step. A won tender of the Kernforschungszentrum Karlsruhe, containing the supply of 10 stainless steel gloveboxes, is the first step into the commercial planning and manufacturing of gloveboxes for our young company. Takeover of Hilligardt Konstruktions GmbH. The company has been actively dealt with all glovebox issues for 15 years. Through this acquisition, the companies received further access to specific know-how in nuclear technology, particularly very unique and detailed knowledge and experience in the planning and manufacturing of gloveboxes and isolators. Fusion of the engineering office and manufacturing plant into Kiki Ingenieurgesellschaft mbH. Kiki Ingenieurgesellschaft mbH has fundamentally two product groups. On the one hand the automatization in mechanical engineering as a supplier for handling and gripper technology. On the other hand the production of gloveboxes and isolators for research and industry. In 2000, a solid growth enabled us to move into our own company building in Malsch near Karlsruhe. Here, we have created the basic conditions for a successful development of the company group. 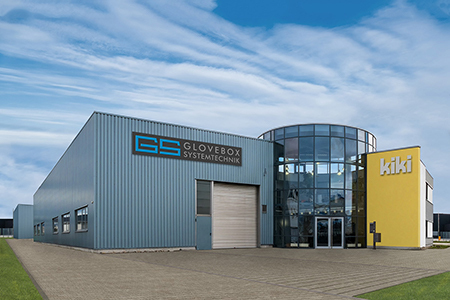 GS GLOVEBOX Systemtechnik GmbH was created by changing the name of Hilligardt Konstruktions GmbH. Over 25 years experience in the theory and manufacturing of gloveboxes as well as isolators were focussed in this company. Sievert Metalltechnik was transformed into GS MEGA Metall GmbH. Another, great step. In October 2015, we acquired our long-term supplier for shaping of sheet metal. Now our both companies are working together even more closely through the in-house production of the housings, interlocks and all other sheet metal parts of our gloveboxes. This guarantees the highest quality and more flexibility in the production process. The growth of our group of companies continues and a new step ensures a significant increase in our production capabilities. The takeover of Senk OHG in November secures our many years of experience in the manufacture of precision milled parts and underlines our claim to manufacture at the highest quality level. Our new company will be operating under the name "kiki Fertigungstechnik GmbH". We are looking forward to many more successful and exciting years. GS GLOVEBOX Systemtechnik GmbH, GS MEGA Metall GmbH and kiki Ingenieurgesellschaft mbH are still under the direction of our two company founders, Gerhard Kieser and Uwe Kirchenbauer. Together with kiki Fertigungstechnik GmbH, our new acquisition from November 2018, our group of companies sees itself best prepared for the challenges of the future.